Used in monitoring, computer, instrumentation and audio applications due to the individually screened pairs, reduce cross talk. 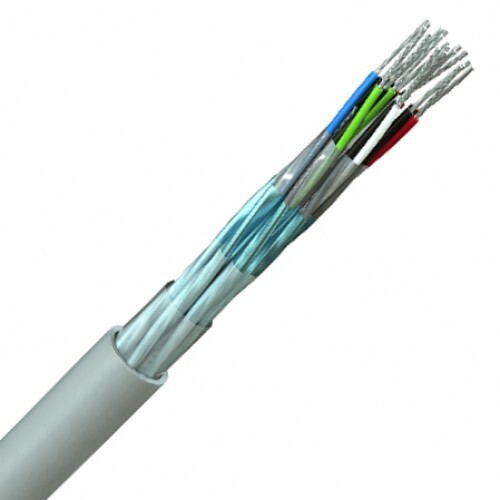 Low losses are achieved through the use of 20AWG or 18AWG conductors making this cable ideal for long runs. Low Smoke Zero Halogen versions are also available. Materials for insulation and sheath can be replace by those that do not emit halogens and toxic smoke. 2 Pair - Tinned copper conductor 20(7) AWG, 0,56mm2, PVC insulated, twisted into pairs, each pair aluminium/polyester foil screened, tinned copper drain wire (22AWG). Grey PVC sheath. Multipair - Tinned copper conductor 20(7) AWG, 0,56mm2, polypropylene insulated. Twisted into pairs, each pair aluminium/polyester foil screened, tinned copper drain wire (22AWG), PVC sheath. 2 Pair - Tinned copper conductor 18(19) AWG, 0,96mm2, PVC insulated, twisted into pairs, each pair aluminium/polyester foil screened, tinned copper drain wire (20AWG). Grey PVC sheath. Multipair - Tinned copper conductor 18(19) AWG, 0,96mm2, polypropylene insulated. Twisted into pairs, each pair aluminium/polyester foil screened, tinned copper drain wire (20AWG), PVC sheath.